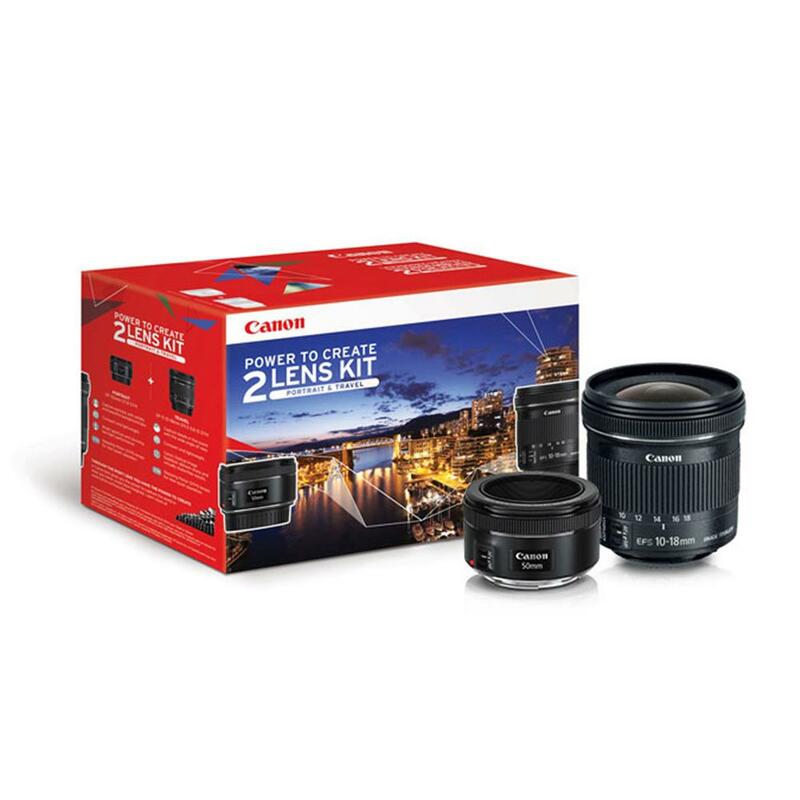 Open new roads to creativity with the Canon Portrait & Travel 2 Lens Kit! 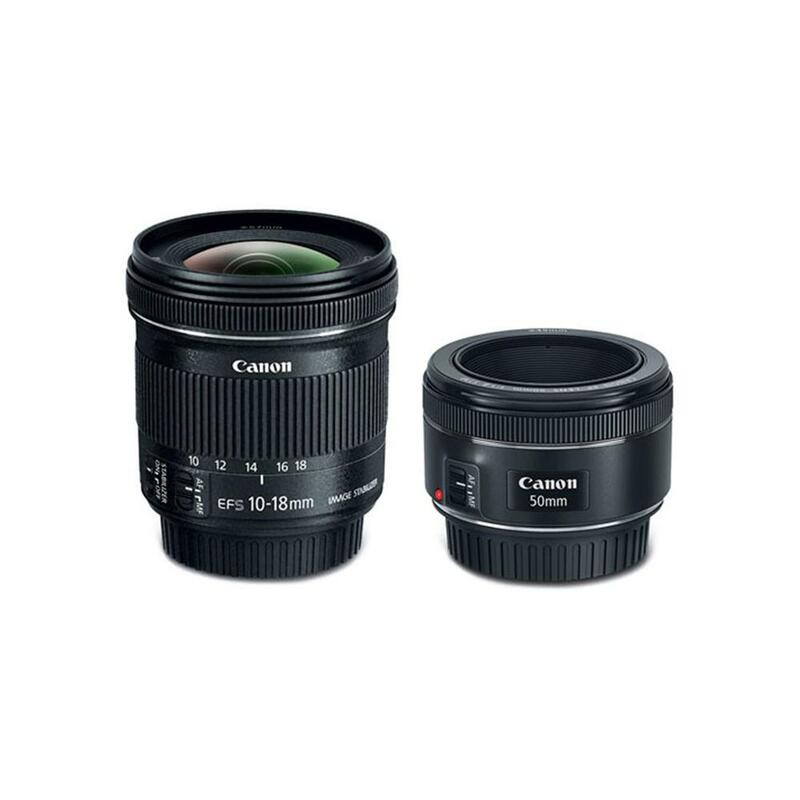 Made up of the compact EF 50mm f/1.8 STM lens and EF-S 10-18mm f/4.5-5.6 IS STM lens, the kit gives you two portable, convenient resources in one package to meet a variety of needs on the spot. Capture amazing detail for portrait photography or impressive landscapes while venturing out on a local or distant journey, and do so one after the other now that you'll have both lenses at your service either attached to your camera or nestled in your camera bag waiting for the opportunity. Ideal for everyday photography, the EF 50mm f/1.8 STM is perfectly compact, boasts a large aperture so you can capture crisp results even in low light and provides beautiful background blur that will make your subject pop. For expansive scenery from tall buildings to inspiring mountain ranges, the wide angle of view from the EF-S 10?18mm f/4.5?5.6 IS STM helps you achieve vivid colours and details during your travels. And because both have a stepping motor, the lenses operate smoothly and near silently capturing video so you get the sights and sounds you intended. Step up and take hold of the power to create. 0.22m (0.72 ft.); 0.35m / 1.15 ft.
74.6 x 72.0mm (2.9 x 2.8 in. ); 69.2 x 39.3mm / 2.7 x 1.5 in. 240g (8.5 oz. ); 159g / 5.6 oz.